Do you care about pharmaceutical manufacturing jobs in Europe? The European Commission is considering amending legislation relating to “supplementary protection certificates” (SPC) in order to support production of medicinal products in the EU. Current patent and SPC law forces manufacturers of generic and biosimilar medicines to systematically build up production capacity outside the EU. Current EU legislation prohibits production of a generic or biosimilar medicinal product during the SPC protection period of the original, even if that production is intended exclusively for export to a country where the protection period has already expired. Production in preparation for the day following expiration of the SPC in the EU is also prohibited. The current legislation is therefore at odds with the EU’s efforts to improve the quality, safety and affordability of medicines, and to promote pharmaceutical production in Europe. 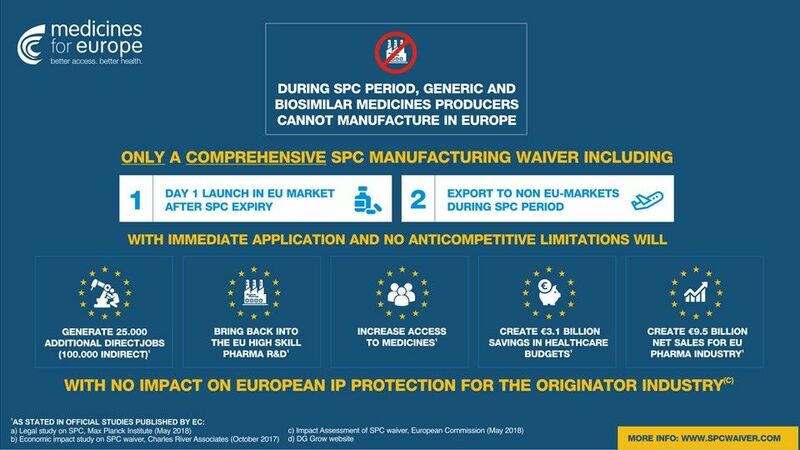 The EU Commission’s initiative to introduce an “SPC manufacturing waiver” is aimed at removing this contradiction and consequently the competitive disadvantage for EU-based generic and biosimilar manufacturers without undermining existing intellectual property rights. Positive support should therefore be given to the Commission’s proposal. Earning money the easiest way? Google Emini S&P Trading Secret to learn more. I’ve been doing really good and earning really well.